The journey out of a life of crime can be a tricky one...especially when the would-be reformed convict is framed for murder. Harley Quinn teams-up with Batman in an attempt to clear her name of a crime she claims she did not commit. Batman is clever enough to know that Harley wants to be a better person in spite of how she might unwittingly present herself, but he needs to find conclusive evidence of her innocence in another engrossing issue written by Sam Humphries with art by John Timms and color by Alex Sinclair. 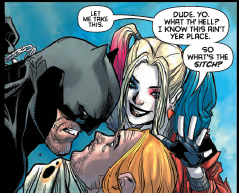 As the issue opens, Harley is hanging out in The Batcave. Batman is studying a murder that seems to have a preponderance of evidence to link Harley to the crime. She wants to work with him. He’s reluctant to let her help but when she offers to be handcuffed to him, he decides to let her tag along. From the victim’s home to the scene of the crime and beyond, Batman tolerates a lovably scattered clown girl as she aids him in investigating the murder. Before long they’re being chased by police and stumbling into a great deal of danger. Humphries continues to put together a really clever multi-layered script. On the surface of it, this issue is a fairly basic masked superhero detective story...the kind that Batman’s been engaging in for well over half a century. The basic mechanics of that are executed quite well in the script. Humphries populates the edges of page an panel with details that make give Harley’s world a deeply engaging depth beyond the surface of an already satisfying story. One of the more clever bits of detail that Humphries casts into this issue happens about 3 pages in. 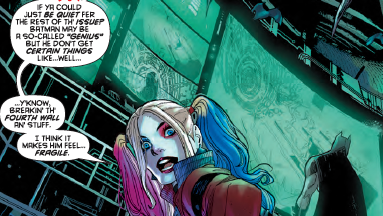 Harley turns to the readers and asks them to “just be quiet,” for the rest of the issue. She tells the readers that Batman doesn’t like breaking the fourth wall. “I think it makes him feel...fragile.” On the surface, this is an endearing, little throwaway joke, but there’s a tremendous amount of characterization packed away in it. Humphries has Harley constantly breaking the fourth wall in her own title. No one else seems to notice, but Batman IS a genius detective and it would stand to reason that he would be able to sense the permeability of the fourth wall in Harley’s comic. Humphries is playing Batman as someone who would rather ignore the insanity that would go along with acknowledging the audience, so he’s deliberately ignoring the readers because yes: they DO make him feel vulnerable to the kind of psychosis that Harley’s suffering from. So there’s a lot being said about HIM in the 30-something words that Harley is speaking to the reader at the beginning of the issue, but she’s also telling us a lot about herself. She’s genuinely trying to be a nice person and here she’s showing evidence of that through empathy. She doesn’t want him uncomfortable around her. And the fact that she would even think to notice Batman’s unease with the presence of the fourth wall shows a sensitivity and attention to mental health, which makes a lot of sense as she spent her early years as a psychologist working with the criminally insane in Arkham. This little bit of text is a reminder that she hasn’t lost track of all that stuff that she learned back then. This may be one of the more intricate pieces of characterization that Humphries is packing into the issue, but it only scratches the surface of Humphries deft peripheral storytelling. Timm continues to sculpt the world of Harley with a skillful sensitivity to passion and emotion. Quinn is having a lot of fun working with Batman and clearly want to join-up with him. Timm renders an earnestness in her face and body language that subtly reveals that she’s clearly having one of the more enjoyable outings she’s had in a long time. By contrast Batman is stony serious and quick to get quite angry. It’s a really nice pairing that would work well as an extended series if Humphries and Timm were interested in exploring it further. There IS a lot of detective work going on in the issue, but there’s also quite a bit of action...and Timm has a very fluid sense of action in the fight scenes as well. Most of the issue may be moody investigation, but Timm handles the action with the kind of power that makes it feel like an even balance between action and drama. Sinclair is given a lot of room to work in a story that features powerful shadows, video screens, arcs of energy and so much more. Illumination feels radiant. Humphries, Timm and Harley work some clever magic together for an issue with #58. The bad news is that Timm steps aside net issue. The good news is that Sami Basri is taking over for him. Basri has a solid handle on the character which should continue a very fun series as it moves beyond a remarkably enjoyable team-up with Batman.